We’ve all experienced it: that brilliant idea that’s so utterly perfect it absolutely has got to work. It’s a certifiable, undeniable, verifiable winner. Acclaim, if not riches, will surely follow. And perhaps that should be your first clue to do a mental double take. Turn away while you still can. All evidence suggests that sort of idea is the one that will have you falling flat on your face. And so, it seems, it was with Sora (655 W. Broadway, Downtown), which recently announced it was closing to re-emerge as Meatball Cucina Modern Italian Eatery (someone has apparently been watching the Chase Business credit-card commercials). In theory, Japanese-Italian fusion ought to have worked. Both cuisines prominently feature noodles (pasta for Italy and udon and soba for Japan). Both have raw-fish traditions (crudo for Italy and sushi/sashimi for Japan). The elegant simplicity for which Japanese cuisine is known ought to find a natural partner in the cuisines of Tuscany and Piedmont. Put it all in the hands of Noriyoshi Teruya, who worked with Nobu Matsuhita in his New York flagship restaurant and helmed his Milan outpost. Give it a splashy—even spectacular—build-out. Add a see-and-be-seen vibe. Surely it cannot possibly miss, right? Only it did miss. Badly. Keli Dailey of the U-T San Diego‘s food section blamed the restaurant’s closing on three factors: the fusion concept, the lack of signage and the prices. The key factor, though, was this: the food. 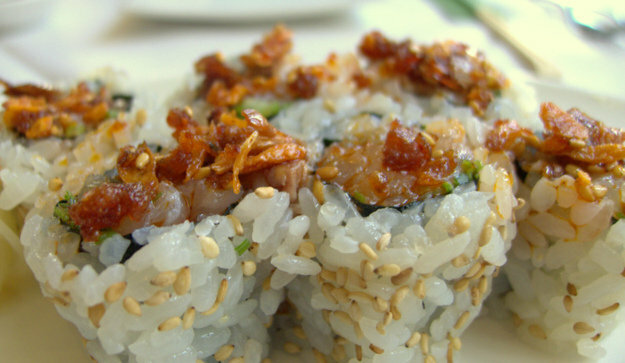 Dishes such as the Spicy Yellowtail Roll with Crunchy Red Pepper showed the concept could work. It had clear bloodlines running to both the east and west, its paradigm being a Japanese idiom (sushi) with the spiciness moved to the outside of the roll and presented in an Italian vernacular. But dishes such as that one were the exception, not the rule. The Lobster and Edamame Ravioli looked great on paper but was a long dish of cream with islands of average pasta filled with indifferent and indistinct seafood. It was a waste of calories, at best, and a felony in five states, at worst. The Risotto Ossobuco (Japanese Style) was neither risotto nor ossobuco nor anything more than a passing reference to a Japanese Izakaya dish. The rice was definitely not risotto nor sushi rice, but a light, fluffy affair more reminiscent of a Spanish offering. It was not a bad dish but it was neither Japanese, Italian nor a fusion of the two. There was nothing wrong with Sora’s fusion concept. As Café Japengo shows, similar ideas have worked in San Diego, both in the short run and over the long haul. The signage may not have been ideal, but it was far more prominent than that of many highly successful restaurants. The price point was not excessive in the abstract, but it certainly was for what you got on the plate.